Adventure World Links, Cheats And Tips Guide: I have maximum coins and/or supplies. What should I do? I have maximum coins and/or supplies. What should I do? 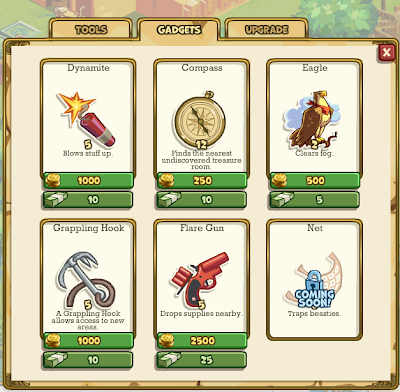 There are a maximum for coins and supplies (100 thousand coins and 100 thousand supplies). If you reached the maximum limit for coins, you should prepare yourself for new adventures to come or other expeditions that needs more gadgets ( dynamite or grappling hooks, net will come soon). It is not worthy to cut trees, grass or stones from your neighbors. They give you few XP and it doesn't make any difference for high level players. Making high expeditions, do make a difference and then, your supplies are never at maximum limit. If you have limit of coins and supplies, use your energy to high level expeditions and it will help you level up. CUTTING NEIGHBORS TREES WON'T HELP!